Pancakes made with almond flour (more the texture of corn meal, made in a friend's Vitamix), apple pulp from juicing, eggs, and honey. Based on the squash pancake recipe. I fried these in palm oil from Tropical Traditions, just because I had it on hand and wanted to try it. I love the almond flour in these! 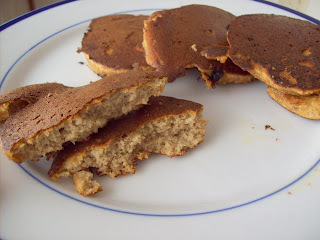 0 Response to "Almond Apple Pancakes (SCD, GAPS, gluten free, dairy free)"